As summer comes to a close and you prepare to send the little ones back to school, you might start thinking about ways you can help ensure their lunches are nutritious, portion controlled and enjoyable. It’s no secret that many cafeteria lunches are questionable in nutritious value, packed full of preservatives and usually lacking in variety. Passanante’s Home Food Service knows our customers take pride in the food they provide to their families – so why should that all stop come September? We’ve pulled together an assortment of back to school lunch ideas to help you continue to provide the same quality of food to your children year round. These lunch box heroes are simple, easy and can be customized for your child’s taste and preferences in a snap. Most of us have had the “Lunchable” debate with our kids… you know the one. Your child wants to eat Lunchables everyday at school but you know the nutritional value of the meal and the quality of the meat is questionable. We all know the reason our kids want Lunchables isn’t because they’re just so delicious, it’s because they’re fun to eat. Lunch kebabs are even cooler and give your kids a chance to play with their food while giving you peace of mind about what they’re eating. Try out a couple of the combinations or make up your own… we promise your child will love them! There’s nothing worse than packing a sandwich in your child’s lunch box only to see it come back with them in the afternoon. What a waste! But if the sandwich you packed is soggy can you really blame them? A trick of the trade is to always place a barrier between the condiments and the bread. (Example: Bread, cheese, condiment, meat, lettuce, bread) Try it out and hopefully you wont get any more sammy surprises after school. Another great option if the standard sandwich is getting boring is pin wheel sandwiches. Just substitute the bread with your favorite wrap, roll meats, cheeses and veggies up like an enchilada and slice into poppable pin wheels. Your favorite variety of peanut butter sandwiches also works great in a pin wheel whether its paired with jelly, honey, banana or green apple — they’re all delicious. Quiches are a great lunch box option if you’re looking to mix it up. Use this opportunity to sneak in spinach, zucchini, onion, asparagus and any of the other veggies you struggle to convince you child to eat at dinner. When paired with egg, ham, turkey, bacon, sausage, or potato these veggie villains will slide right in undetected. Tasty and filling, parfaits are an excellent lunch box addition. Layer greek vanilla yogurt and cubes of your child’s favorite fruit into a small resealable round tupperware or jar. Pack granola and nuts in a separate baggy to keep crunchy and relax knowing their dessert is good and good for them. An easy lunch box side option, pasta salad is a great substitute for greasy potato chips. Add chopped carrots, celery, cherry tomatoes, olives, feta and Italian dressing for an irresistible lunch time favorite. 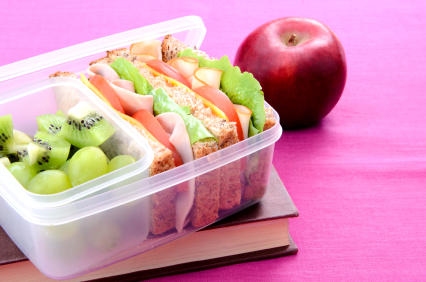 Have some awesome lunch box ideas of your own? Please share them with us and your fellow Passanante’s customers on our Facebook page!! This entry was posted in Food Tips, Recipes and tagged back to school, Food Delivery Service, lunch recipes, lunchbox, Passanante's Home Food Service by Passanante's Home Food Service. Bookmark the permalink.